BIYOMON in HD!!!! I’m very happy about this one. She turned out very well and I hope Hythe looooooveesss it! Biyomon is about 35 inches in height. Feather tips and eyes are embroidered on. There is some wire in the small feather to give it’s shape. She is a LIFE-SIZE plushie of Biyomon. My next Plushies are going to be be Palmon, which i'm putting last touches on now, and Spike for MLP! I am open for commissions. If you interested in asking me about Biyomon or something else please message me. Hi do you take commission atm?? 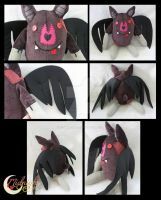 I am very interest in a Biyomon plushie for the this summer! Thats so cool are you still doing commissions? Whats a close price for 1? I would like to see a life-sized Patamon. I don't know what to say! 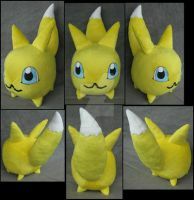 When I was younger and more imaginative I would've just about killed to find and get my hands on these kinds of plushies. Right now the only thing keeping me from seeking my own set is a lack of sufficient funding. How did you sew the border of the eyes? look at the details! awesome! could u do wargraymon? and if u can eho much would that be? Fan made, no only realistic, but LIFE SIZE! AAAAAAAA I WANT THIS!!! AND PALMON!!! Hahaha I'll let him know. He was pretty excited to see Gatomon and Biyomon. Gabumon was my favorite! Awesome I can't wait to see her! omg she is perfect. i spy gatomon! Now that's a great work. COngratulations for you. 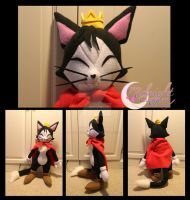 Not only that plush is in 1:1, but also how it's done. Great that you decided to done eyes and feathers llike that . And how did you do her head feather so that Iit would stay that "swirled"? Also If I could ask, what you stuff your plushies with? Beacuse I'm still looking for the right stuff to stuff bigger plushies and can't find anything nice (probably will have to look for something on ebay or amazon). Thank you so much for your kind words. I do progress pics on my tumblr account of all the plushies I do. For what I stuffed her with, is simple stuffing you get at Joanns or hancocks. As for her little swirl, i actually have no stuffing in it, just a lot of wire to give it some strength to stand on its own. I wanted it to be flat like it is in the reference. That's the reason why I asked you with what you stuff them since I'm not from US and if I order some fillers from amazon or other source I would like to ask some people earlier to be more sure of what to get . A wire in the swirl? You aren't affraid that it will come out? Just one more question - with what you stuff entire plush? Scrapped materials or some sort of fluffy material?